Six months ago, I was referred a 67-year-old doctor who was profoundly depressed after suffering a heart attack. His cardiologist requested an urgent psychiatric consultation because he was suicidal. A general practitioner, he had always wanted to own an elegant house in Queen Astrid Park. In his pursuit of happiness, he worked assiduously, took a large bank loan and was planning the renovation of the bungalow when he collapsed in his clinic after experiencing an acute chest pain. While recuperating, he wondered whether he could work again and worried about the financial burden. During our psychological therapy session, he confided about having been preoccupied for many years with the "dream house" since visiting a patient living in that prestigious part of Singapore. He writhed in mental anguish - his happiness had been shattered. Happiness and depression are on the two ends of the emotion spectrum. Recently, there has been a surge in research into this bipolarity of emotion, with the advent of new brain scanning techniques. As neuroscientists ponder the convoluted brain neurotransmitter systems of dopamine and serotonin regulating our emotions, we know that happiness is personal and intrapsychic - a psychological term referring to the internal psychological processes of the individual. People externalise their happiness by sharing with friends, giving to the less fortunate or helping neighbours. Happiness is a topical issue not only in the heartland kopitiam but, also, the hallowed halls of the United Nations in New York. Many countries, including Bhutan and Britain, have constructed their own Happiness Index. In the homes of many elderly Chinese are three deities - Fu, Lu and Shou - who personify their aspirations of wealth, happiness and longevity. As you listen to the Singapore national conversation over the next few months, a central theme I suspect will be "happiness", or the lack of it, and it will pervade the issues of jobs, housing, public transport and foreigners. Factors associated with happiness and satisfaction in late life have also intrigued many researchers in the field of gerontology. A few years ago, the Department of Psychological Medicine of the National University Health System conducted a study of elderly people living in the Chinatown and Toa Payoh districts. About 72 per cent of the Chinatown elderly and 69 per cent of the Toa Payoh elderly indicated that they were happy and satisfied with life. However, their reasons for life satisfaction were quite different. The Chinatown elderly lived in smaller HDB flats and preferred to meet friends in community centres or the void decks; their main reasons for life satisfaction were family or social relationships and good health. The Toa Payoh elderly were living in bigger flats and their main reasons for life satisfaction were the comfortable homes and good health. When we assessed the rate of depression in both groups, the prevalence was 5 per cent in the Chinatown elderly and 9 per cent in the Toa Payoh elderly. 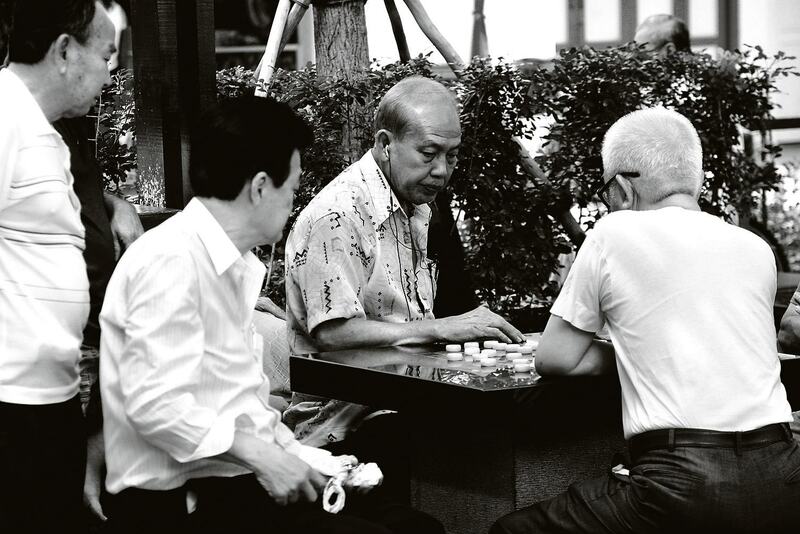 There was more social interaction among the Chinatown elderly who tended to congregate at public places to chat, watch television, read the papers or play mahjong. The Toa Payoh elderly did not interact as much with neighbours and seemed more isolated and lonely. In short, the Chinatown elderly, although poorer, were happier with lower prevalence of depressive disorder. You may wonder how many of the Chinatown elderly will participate or are even cognisant of the imminent national conversation. With their long years and wisdom, they can tell us something about happiness, if we have time to listen and understand their dialects. Because of the change in family structure, more Singapore elderly will be living alone in future and cannot expect much support from close relatives. Living alone and loneliness were issues explored in a recent study in the Jurong district by our research team. We found that a sense of loneliness, and not living alone, was a risk factor for depression which could lead to suicidal ideation. Many people lament the passing of the kampong or village socio-ecological community of interdependence. In the past, living in a village allowed people to interact and cooperate in caring for their neighbours. With modernity, the ethos of the kampung spirit is lost. It may be possible to resurrect the same community spirit within blocks of flats by identifying, within each block, the frail and the able-bodied elderly. If the latter can become informal carers of the former, a future tradition could grow within the precinct. And this is the challenge - to build not just a cohesive and inclusive but also caring community, which is the soul of the nation. As for the doctor, I reviewed him last month and he had improved after four months of psychological therapy. No longer depressed or suicidal, he had begun to recalibrate his priorities in life and felt the "dream house" was no longer at the top of the list. He decided to work part-time and looked forward to thrice-a-week morning walks at the Botanic Gardens, Labrador Park and MacRitchie Reservoir with his friends from church. His joie de vivre now was admiring the beauty of nature, and spending more time with family and friends. In fact, his wife persuaded him to stay in their present apartment and sell the bungalow, which should fetch a princely sum today. He is a case study to repudiate the myth that suicide is not preventable. Before he left my clinic, he reflected on the dark days when he wanted to take his life and, with a wry smile, quipped: "Everybody wants to go to heaven but nobody … nobody really wants to die." I agreed. Dr Kua Ee Heok is a Professor in the Department of Psychological Medicine, National University of Singapore, and Senior Consultant Psychiatrist in the National University Health System. He is President of the Pacific-Rim College of Psychiatrists and President of the Gerontological Society of Singapore, and the author of Ageing Baby Boomers: The Most Pressing Issue of the Age (Write Editions, 2012). Tan Chuan-Jin urges S'poreans to keep "open mind"
Less tuition = less stress in school?